16pp., 4to. Stitched pamphlet. Aged and worn. The lay-out is staid and old-fashioned, reminsicent of the 1880s. Very much geared to the St James's Palace market, with such titles as 'Bicycle Gymkhana and Musical Rides' by Major Walter Wingfield, 'No Army, No Empire' by the Earl of Dunraven, and 'Roulette: The Winning Rules' by 'Sperienza'. Includes various of Sir Bernard Burke's publications, and Hertslet's Treaties, as well as 'Dress Worn by Gentlemen at His Majesty's Court. The latest date within the catalogue is 1903. No other copy traced, either on OCLC WorldCat or on COPAC. 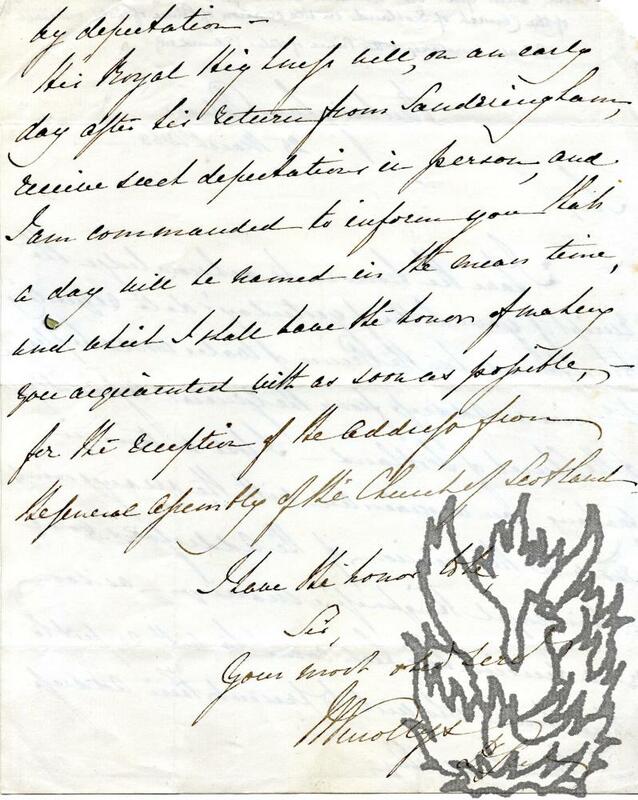 Autograph Letter Signed ('W Knollys | Lt Genl') to J. Maitland, on the presentation of an address to the Prince of Wales by the Church of Scotland. 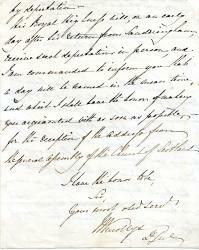 25 March 1863; Buckingham Palace. 4to, 2 pp. Good, on lightly-aged laid paper, with small area torn away from top corner (not affecting text). 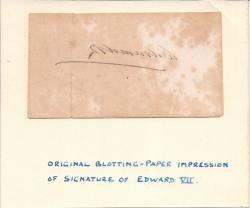 Docketed at head in an Edwardian hand: 'From Lieutt Genl. Sir William Knollys to the General Assembly of the Church of Scotland on the occasion of the Prince of Wales' marriage | Private Secretary to the Prince of Wales [Edward VII]'. Printed on one side of a piece of vellum-style paper, dimensions roughly 270 x 205 mm. Ruckled and heavily discoloured: now light-brown in colour. 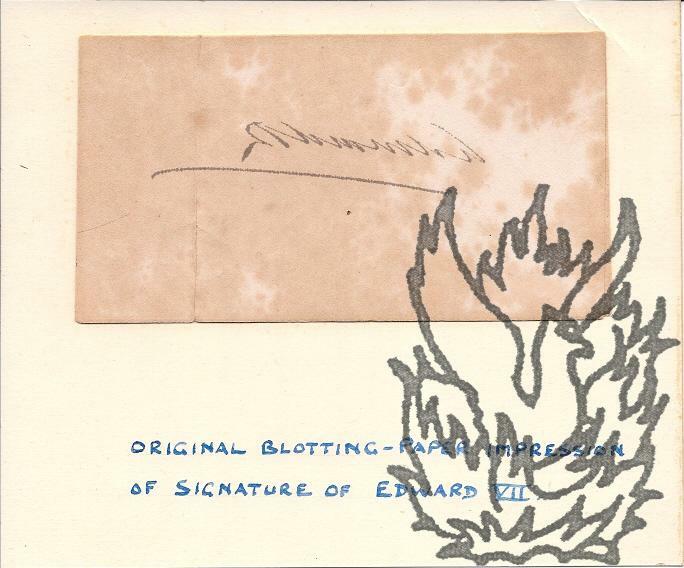 Traces of previous paper mount adhering to blank reverse. Small triangle (edges shorter than 1 cm) chipped away, and repaired with archival tape. Text clear and entire. (Printed copy of?) Autograph Letter Signed to unnamed correspondent. Without date; headed 'Marlborough House' in manuscript and on crested letterhead. Queen-consort (1844-1925) of King Edward VII. 2 pages, 16mo. Bifoliate, with recto of first leaf bearing a mourning border. Reads 'Marlborough House | I have read with great interest the Report of the work of the Field Force Fund and I hope the Appeal for Friends will meed with a generous response to enable the Comforts that are required to be Sent to our Soldiers at the Front - | Alexandra'. The homogeneity of the ink implies that the item is a printed copy. Note: Field Force Fund, 1916-1918. Sir Henry Keppel, Admiral of the Fleet.